Hotels on Phi Phi Island impress the visitor with their varied in the quality of the natural beauty, the amenities and services. Most of the accommodation offers world class views of the magnificent Phi Phi islands, the large majority are on the beach, some have very private villas and the family run bungalows resorts offer the traditional island hospitality. You can't really go wrong with any of the hotels on Phi Phi Island, a paradise at any price. Let's start with the least expensive hotels on Phi Phi Island and work out way up to Phi Phi Island Resorts that are a bit more pricey. Phi Phi Hill Resort offers beautiful bungalows that overlook three pristine beaches. One can view the Andaman Sea, scintillating white sand, the distant mountains and unforgettable sunsets from the premises of this reasonably priced hotel on Phi Phi Island. The bungalows are spaced adequately apart to ensure privacy. Beautifully landscaped, the Phi Phi Hill Resort provides the complete package in which to experience the majesty of Phi Phi Island for those on a budget. Overlooking the famous Long Beach from a height of about 30 meters this has some of the most startling views. Phi Phi Don Chukit Resort is another reasonably priced hotel on Phi Phi Island. This resort offers air-conditioned suites with satellite TV, refrigerator and mini-bar as well as smaller, less technologically equipped bungalows with fans. 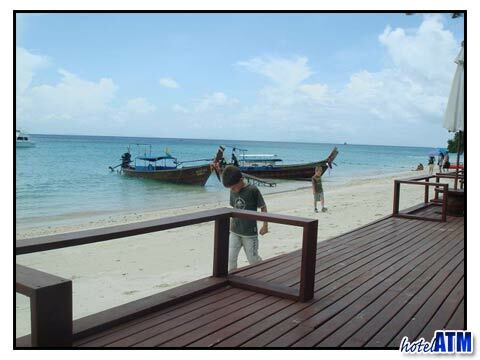 Like many Phi Phi Island hotels, it is situated precisely on the beach for the tourist's convenience. Nearby this hotel on Phi Phi Island is Phi Phi Don Village the sight for shopping, the best island nightlife and hob-nobbing with the locals. Phi Phi Banyan Villa is one of the most popular hotels on Phi Phi Island because of its central location on the beach with breathtaking views from the rooms of the village and hills. This Phi Phi Island hotel has a village feel while at the same time affords the visitor seclusion around the confines of the pool and Jacuzzi. This hotel on Phi Phi Island is for the traveler who seeks proximity to the town with the comforts of a secluded resort. This is close to 5 dive operations and is only 250 meters from the pier and so is popular amongst Phi Phi Divers. Phi Phi Natural Resort, one of Phi Phi Island's noted hotels, is located at one of the most peaceful spots on the island. It is known for its magnificent island views of the craggy Mosquito island and the near perfect Bamboo island. One can pick out coconut palms and lush vegetation. Surrounded by Mother Nature this resort, out of all of Phi Phi Island hotels, offers the peace and serenity of a retreat. Phi Phi Natural Resort consists of 70 well designed and well spaced bungalows for the tourist's privacy, pleasure and comfort. Phi Phi Island Village Villa offers the ultimate in luxury and privacy to the tourist. It is in a setting on the bay inaccessible by roads, surrounded by cliffs and views of the mountains and ocean making it a true getaway. The 2 storey living areas are truly luxurious offering the visitor to this Phi Phi Island hotel all the conveniences of home and more. The extensive facilities of the wider hotel including tennis courts, 2 pools and a diving complex make it a real charmer. The visitor gets the best of both worlds at this luxurious hotel on Phi Phi Island. Another remarkable high end retreat is the Zeavola Resort Phi Phi . It has invested in the most sophisticated interiors on the island and also boasts the most exclusive fusion restaurants and an award winning spa.